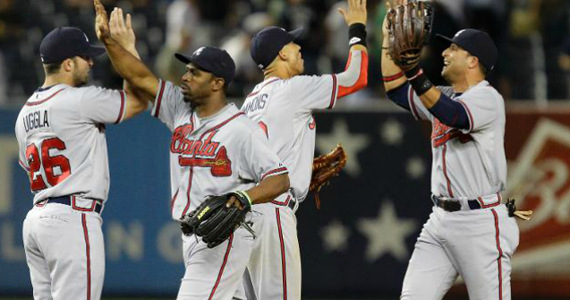 Jobu Reviews the Yankees’ series loss to the Atlanta Braves. I know we touched upon this the first time these two teams met, just last week, but why in the world are did the Yankees have to play the Braves twice this year? Was there no other way to fit another team in there? The Yankees barely play two series against the other non-division American League teams as it is. We couldn’t play some other cool NL team like the Dodgers, or the Brewers? Anyway, I guess I’ll stop my crying and get on with the series review now. The Yankees came into this series on a nine game winning streak, looking to make it twelve in a row with another sweep (well, at least looking to win another series anyway). 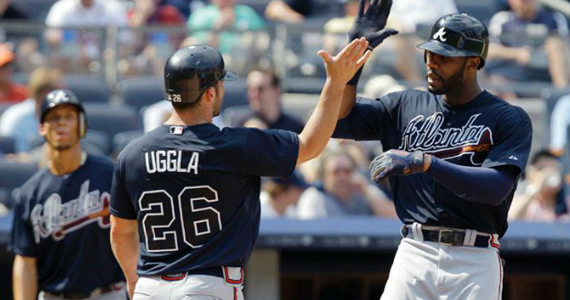 In the end, The Braves brought the Yankees back down to earth a bit by taking two out of three in the series, including a pretty serious beatdown in the decisive game three. When you want to win a series, it’s always good to start with a win in game one. The Yankees finally got a dominant performance from their ace, some clutch hitting from the Captain and some tack-on homers late in the game en route to a big 5-2 win in game one. Opening salvo? Opening Salvo! I know it wasn’t a perfect game, or a no-hitter, or on the level of the way R.A. Dickey has been pitching of late, but CC Sabathia was pretty dominant in the first game of this series. It seemed like a “here we go again” situation when the game first started, as The Big Lefty™ allowed a leadoff triple to Michael Bourne, but he got out of that with only one run allowed, and didn’t allow another one until the top of the fifth inning, when Bourne singled in Jayson Heyward with one out in the inning, following a flubbed possible double play by CC himself. Sabathia was very efficient with his pitches in this game, and it allowed him to go the distance for his ninth win of the season. His final line looked like this: 9 Ip, 7 H, 2 R, 1 BB, 10 Ks and 116 pitches. It was nice to have the big guy contribute to the winning streak, and not in the sense that he created a dramatic victory by putting the team in a 4-0 hole. Welcome back CC! The early going of this game was an exercise in frustration. Facing Mike Minor, who still had an ERA over six coming into the game despite shutting out the Yankees over seven innings in the aforementioned comeback game against CC last week, the Yankees didn’t even get a hit until the fifth inning, which is also when they finally uncoiled and broke into the scoring column as well. Alex Rodíguez led off the inning with a line drive single to center and moved to second on a wild pitch. Minor then walked Robinson Canó, which set up first and second nobody out, and a real chance to do some damage for Andruw Jones. Unfortunately,Jones struck out looking, which brought up Russell Martin. Martin did something that I usually hate when he swung at a 3-0 pitch, but the fact that he laced it into the left field corner for an RBI ground-rule double made me ok with it. With the score now 2-1 and men on second and third, Chris Stewart (who was also playing for some reason) popped up in in foul territory to the first baseman. 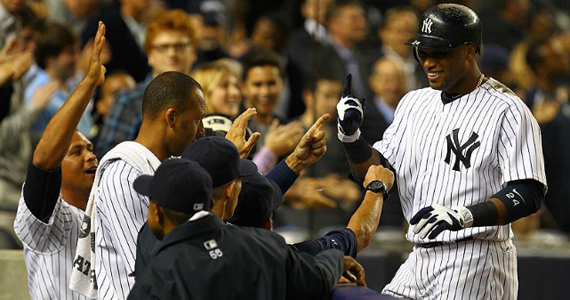 The inning was in danger of being blown, but luckily for the Yankees, Derek Jeter was up. Jeter smacked a 3-2 pitch up the middle for a two-run single that gave the Yankees a 3-2 lead. They would not look back. In the bottom of the sixth, Mark Teixeira added some insurance by hitting a X-X Xball over everyone in left field. The solo bomb pushed the Yankees lead to 4-2, and the fireworks weren’t quite over yet. In the bottom of the seventh, the Captain did it again, singling up the middle to drive in Stewart, who had just doubled following a double play grounder by Martin. The final run came via another home run, this one by Canó in the bottom of the eighth. the bomb, which went out to the deepest part of the ballpark in dead center field, gave us our final score of 6-2, and secured the Yankees victory. It was Canó’s second home run in as many days, and his thirteenth of the season. This game was frustrating on many levels for Yankees fans. When you’ve won ten games in a row, it’s hard to get too upset at a 4-3 loss against a team battling for first place in their division (especially coming off recently sweeping that team), but there were some parts of this game that were very annoying. The Yankees could have easily won this game, but they struggled with men on base and even got a couple of guys thrown out at home plate, and that’s not the way to win ballgames. Hiroki Kuroda didn’t dominate this game, certainly, but he only allowed four runs in his seven innings of work, which should be enough with an offense like the Yankees have. That being said, Tim Hudson is no slouch, and he happened to hold the Yankees and work his way out of sticky situations all night long. Kuroda gave up a run in the third on a ground out by Andrleton SImmons (whose name sounds like a name my brother and I might use while mocking our dad’s hispanic accent and inability to remember player names), which followed a leadoff triple by Heyward. The Braves put up two more runs on Kuroda in the fourth on an RBI double by Chipper Jones and another RBI single by SImmons. The fourth and final run scored on a hard grounder by Heyward that hit the Teixeira’s foot at first base and caromed almost to center field. Them’s the breaks. The Braves didn’t pound Kuroda by any means, but they took advantage of the base runners they got, and got some clutch hits to score their runs. Kuroda’s final line looked like this: 7 Ip, 6 H, 4 R, 3 BB, 6 K, 97 pitches and his seventh loss of the season. tough one for Hiroki. The Yankees had two runners thrown out at home in this game, which only added to the already swelling frustration that was the offense in game two. The Yankees once held a 2-0 lead in this game, when Nick Swisher followed a single by Tex and a double by Raúl Ibañez with a double of his own that cleared the bases in the bottom of the second inning. In the bottom of the fourth, down 3-2, the Braves gifted the Yankees the tying run when Ibañez reached on an error by Freddie Freeman, went to second on a walk to Swisher and scored on another error, this one by Jones at third. That would be it for the Yankees offense. This was definitely another RISP fail game, but also a base running fail game of sorts as well. In the bottom of the fifth, with men at first and second following two two-out walks, Swisher lined a ball for a single to right. Heyward came up throwing and nailed Tex at the plate. It was not a bad send, or a stupid play, or bad base running. It was just a great throw from a right fielder with a cannon arm. It happens. With two outs, I thought that was a good send. In the bottom of the seventh, the Yankees used a single by Granderson, a walk by A-Rod and a ground out by Canó to put men at second and third with one out. Instead of lifting a fly ball, or hitting a grounder to the right side, Tex hit a grounder to deep third. Instead of holding at third, Granderson was thrown out at home by thirty feet. Kind of terrible, although Grandy probably would have been tagged out if he tried to go back to third too… That’s baseball. Suzyn, and the Yankees lost. Notable Offense: RBI – Swisher 2 (42), 2 hits for Swisher. Thanks for coming to play, Nick! So the ten game winning streak ended, but the Yankees still had a chance to take the series, with Phil Hughes on the mound against Tommy Hanson. Hughes had been pretty great lately, and Hanson has been having some command and home run issues this season (ask my fantasy team), so I felt pretty good about the Yankees chances in this one. What ensued was an absolute slug fest, as the two teams combined for nine home runs. The problem was that the Yankees didn’t feel like putting anyone on base for those and the Braves did, which was the difference. 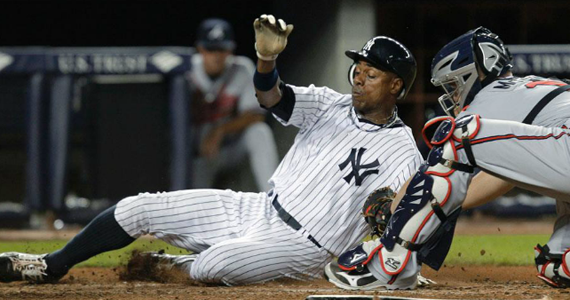 In the end, the Yankees got doubled up at 10-5, their first series loss since the end of May. It was bound to happen, right? Sadly, I called this outing for Hughes. I have been gushing on my blog about his last handful of starts but, after his last start, I basically predicted he would soon put up a stinker, because I was starting to believe in him a little too much. Hughes certainly did his part to keep me on my toes for the next few starts, allowing four home runs in just 4.1 innings of work (his shortest outing since April 25th). I couldn’t watch the game, because I was at work and my MLB.tv gets blacked out in this area, but I imagine he was just leaving pitches over the middle like he did when he was struggling. Correct me if I’m wrong. He allowed a two-run homer to Dan Uggla in the top of the first and solo home runs to Martín Prado, Heyward and David Ross in the third, fourth and fifth respectively. Not a good outing for Phildo. His final line looked like this: 4.1 Ip, 6 R, 6 H, 0 BBs, 5 Ks, 83 pitches and his sixth loss of the season. The Braves hit their fifth home run in the top of the eighth (a two-run homer by Heyward off of Boone Logan) and also scored another run in that inning and one in the ninth off of Freddy García. Those late runs spelled the end of any happy fun comeback thoughts, and the game ended 10-5. If you’re going to hit four home runs in a game, it’s only polite to hit all solo home runs. Otherwise, the game would be way too difficult for your opponents to win, right? The Yankees had just about the weakest four home run game I have ever seen. They got solo home runs from Jeter (leading off the game), Chavez (4th inning), A-Rod (6th inning) and Canó (sixth inning) and only managed one other run, on an RBI single by Granderson in the bottom of the seventh (that inning ended with a huge double play by A-Rod). Home runs are fun, but this game really wasn’t for the Yankees.